Show Times: Monday - Thursday 7:30 p.m, doors open at 6:30 p.m. Hurry and take advantage of this Buy One Get One offer for Terry Fator tickets. Promotion is valid for Category D tickets and must be purchased in pairs. Discount will be displayed per ticket. 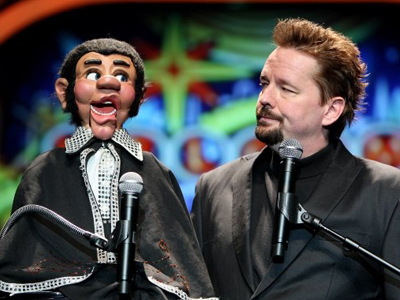 Book your tickets today and get up to 30% off to see Terry Fator at the Mirage. Be sure to compare all offers before purchasing to get the best price. Tickets start at $55 before taxes and fees. Terry Fator amazes audiences by singing like famous entertainers from Elvis to Cher without moving his lips. 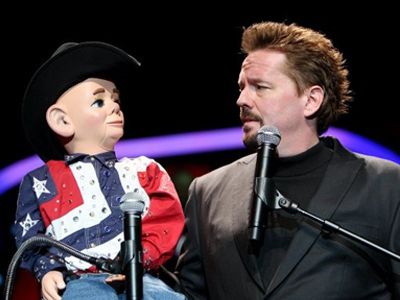 Save up to $22 off per ticket to see Terry Fator with this offer today. A master puppeteer, he brings to life his cast of lovable puppet co-stars. Rates from $60 before discount, taxes & fees. Hurry and book this special offer to see Terry Fator live at the Mirage Las Vegas. Save up to $36/ticket with Rates from $49 before taxes and fees. 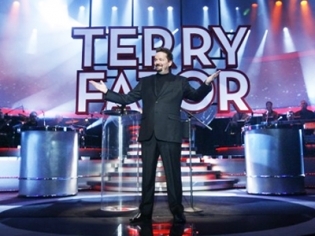 Active Military members get up to 35% off tickets to see Terry Fator at Mirage! Tickets from $44 before taxes and fees. Military ID must be presented at pick-up for the discounted rate. Get your tickets now to see Terry Fator Live in 2019 at the Mirage Las Vegas. Tickets for the show start at just $60 before taxes and fees. 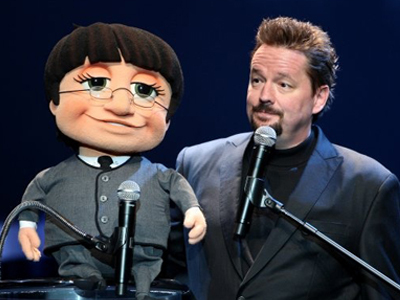 Senior Citizens save up to 35% off tickets to see Terry Fator at the Mirage Las Vegas. To qualify for the Senior Rate, you must be 62 years of age or older. Located inside of his very own theater at The Mirage Las Vegas, Terry Fator: The Voice of Entertainment is a one-of-a-kind show that mixes elements of “America’s Got Talent” winner Terry Fator’s unparalleled ventriloquism, spot-on celebrity impressions and a musical set accompanied by a live, seven-piece band that offers humorous takes on artists such as Cher, Maroon 5 and Garth Brooks. 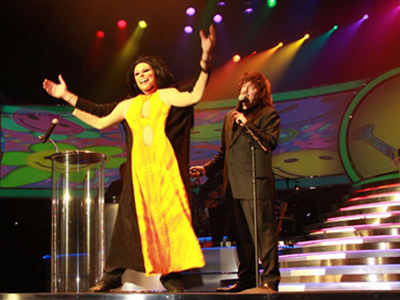 Since then, Terry Fator has been voted “Best Impressionist” by Las Vegas Weekly’s Vegas’ Best, and he continues to stun audiences with his unmatched skill as a ventriloquist and spot-on celebrity impressions all backed by a seven-piece live band inside of his very own theater at the Mirage. With his show, Terry Fator: Ventriloquism in Concert live at The Mirage, Fator brings to life the unique personalities of his created characters including Winston, the impersonating turtle, the affable Emma Taylor and the most recent addition Wrex, a crash test dummy. When it comes to Las Vegas live entertainment, Terry Fator: The Voice of Entertainment live at The Mirage is a one-of-a-kind, must-see show that not only blends Fator’s superb ventriloquism skill with fantastic celebrity impressions, but also includes musical performances that offer the “America’s Got Talent” winner’s hilarious takes on artists such as Elvis Presley, Garth Brooks, Cher and many more. Wow such a great show! You really can’t tell that’s him! So believable. I want to bring my friends back when we visit again. This show was spectacular! Terry’s impressions are fabulous. There were times I actually thought the puppets were singing. After seeing his show, it makes me want to go back for more. It was well worth the money. This is a must see! Best show ever….we laughed so hard! Highly recommend! Went to see his Christmas show and going back for a second time. Well worth it show.I’m a big cridick. Have nothing bad to say. A Hilarious Show – An Amazing Ventriloquist! You will not stop laughing! Terry Fator is so Funny and has such an Incredible Talent! This Show was well worth every penny we spent! Excellent All the Way Around!!! What a terrific show! I laughed, cried, and, just thoroughly enjoyed myself. I love Terry! If you go to Vegas you MUST see his show! Phenomenal!!!!!!!!! Saw Terry Fator’s show last year. He sings (all with his lips closed) like a man. What an AMAZING show! I laughed, I cried….! Definitely worth seeing! Great show loved every minute of it! Terry is an amazing talent. I thought this show would be a waste of time. Boy was I wrong Terry is a musical genius. Not only can this guy sing better with his mouth shut than 99% of singers. He also is amazingly funny without being crude. There is no one I would not recommend this too. If you are going to see him I can tell you, expect to have a great time! Terry Fator puts one heck of a show. So many times I forgot he was using puppets. The puppets truly seemed to have their own personalities. Terry is multi talented and puts on a great show! Highly recommend seeing this show!